These derelict buildings were acquired from the University of Edinburgh for conversion to resedential use. 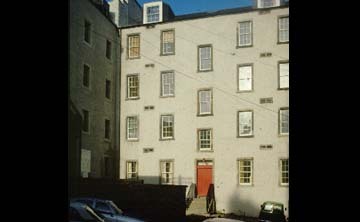 This was part of Kantel's early work, when energy was focused on the Old Town of Edinburgh and Glasgow's Merchant City. The internal detailing was crisp and derived heavily from the main restoration theme, with stop-chamfer/timber detailing, a motif repeated in much of Rob Hunter's work.